I like to know my numbers! Recently I bought my third Nike sensor. The first one died a sudden death, due to bad batteries. The second sensor, I lost four weeks ago during a run. So now I'm on my third. Nike Sensor, but not Nike schoes! 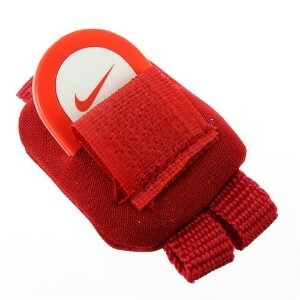 Because I don't have Nike shoes, I had put my sensor in a specially made little pouch, (see picture). This little pouch can be attached to your laces. But the last time I changed my running shoes, I must not have tied the pouch tightly enough. During the month it took me to get my new Nike sensor to work, I discovered how much I like it. I really missed the feedback! Especially because all I have do to, is activitate the sensor. Then, when I get home, I only have to plug my iPod into the computer, and all my running data are automatically transferred to my Nike+ account. Which I love, because apparently I'm too lazy to write them down myself. The reason it took me a month to replace my old Nike sensor, was because my iPod didn't recognize the thing! It kept saying: 'Walk around to activate your sensor.' I have never walked so much, but nothing helped. So I googled 'problems with Nike sensor' and found out mine was a well known problem. In the end I pushed a lot of buttons, and suddenly my iPod found the sensor. Halleluja! I started using the Nike+ sensor on the 14th of June in 2009. Since then I have run 1724.09 K, in 211 hours, and have averaged a distance of 1725 K. And, I have achieved Blue Level Status, whatever that means. Apple Nike + iPod Sport Kit: how much? 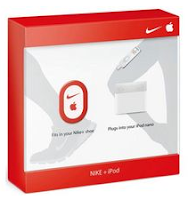 My original purchase of a Nike+iPod Sport Kit set me back $26.34. I bought the iPod on eBay for $56,-. The Nike+iPod Sport Kit comes with a sensor, and a receiver. The receiver you plug into your iPod, and the sensor you put into, or on, your shoe. I haven't needed to replace my receiver, but have had to buy two new sensors. All in all, my start up costs with the Nike=iPod Sport Kit cost me about 82 USD. Since then, lots of apps have become available for mobile phones, which help you track your running routes. But right now, I can't be bothered to learn how they work. I'm way too happy I've figured out how to use the Nike+ Sport Kit. I used to use my IPod and the sensor, but since getting my IPhone, I use Runtastic app. I love it! I have a large armband I bought for it. I like having my phone on me just in case. I feel the iPod and the sensor have become has-beens. Everyone seems to be using apps now. But I don't have an iPhone or smartphone for that matter,so I'm stuck with with it.